KATHMANDU, March 30: The Election Commission (EC) will start printing voter identity cards from April 2 in a bid to conduct the upcoming local-level elections in a free, fair and credible manner. EC officials are currently busy with finalizing the voter roll collected from across the country. The election body has collected details of 14 million voters. "The printing of the ID cards will help us make the elections more transparent and credible," said Election Commissioner Narendra Dahal. "We plan to complete the printing before the third week of April," he said. The ID cards will be distributed to the voters, including those who had obtained temporary voter ID cards in 2013 CA elections, by mobilizing local officials. In order to ensure maximum voter turnout in the elections, the EC is also considering allowing eligible voters to cast their votes by producing the ID cards obtained in previous elections if they fail to acquire new cards. 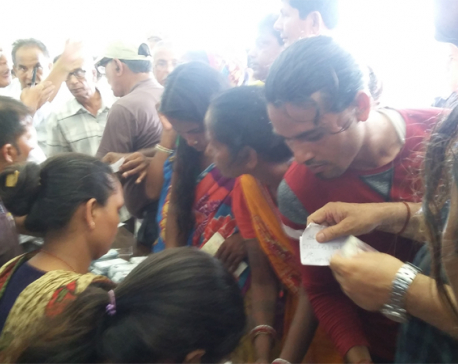 "We will issue a public notice to inform the people about where they can get their cards," said Chief Election Commissioner Ayodhee Prasad Yadav. Voter ID cards were first distributed in 2013 Constituent Assembly (CA) elections. The cards, however, were temporary in nature. Encouraged by the efficacy of voter IDs in making the elections more credible, the EC this time is distributing 14 million ID cards with security code. The EC has arranged almost all the logistics required for managing the elections. "Previously used ballot papers have already been disposed of. And, an additional 30,000 ballot boxes are being procured this week," said Dahal. India is providing vehicles and voting screens, among others, while the EC is receiving 11 types of logistics from China. The items being supplied by the northern neighbor include neutral pens, markers, thumbtacks, clips, staplers, staples, scissors, glue sticks, calculators, ink pads, punchers and horologes and stamp pads. After Indian authorities expressed their inability to deliver indelible ink, the EC is procuring it on its own. "They had previously expressed their commitment to deliver the ink, but they could not fully assure us. That's why we have begun the procurement process on our own," said Dahal. "We can use the India-provided ink in provincial and central elections, if not this time," said commissioner Dahal. Until Wednesday, the EC has printed ballot papers for 51 districts. "We are first printing the ballot papers of districts with larger number of political parties contesting," said commissioner Dahal. The commission is also imparting training on trainers to be deployed in villages to educate voters about the voting procedure. An estimated 21,000 officials are said to be deployed across the country for a month, starting April 10.